information about the history of a Historic Watertown Home? is one of the best resources of local history and the genology of the people who shaped the history! “Historic Home of Watertown 100 Years or Older” A Bicentennial Project of the Watertown Preservation and Restoration Bicentennial Committee, Sponsored by the Watertown Rotary Club (published pre-1985). “Old Mansions of the North Country, No. 26”, by David F. lane, appeared in the Watertown Daily Times circa 1955. City of Watertown’s “Comprehensive Historic and Architectural Resources Survey”, Prepared by the Cornell University, College of Architecture, Graduate Program in Historic Preservation Planning (Dana Mintzer McClive, lecture), December 1989.
visit the museum & garden, join one of their many events or pick up information for a historical & architecural walking tour! 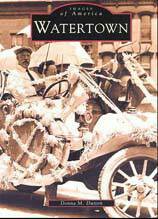 A visual history of WAtertown's first 200 years in DVD and VHS format. are also an excellent source!